It’s the most wonderful time of the year! Well, at least that’s how the jingle goes anyway. The stores are full and frantic, the traffic seems to have either disappeared or doubled (depending on where you live) and the Christmas lights everywhere make the country look and feel more festive. With an incredible selection of events to check out and destinations to head to, the only thing you may be lacking is time. Luckily, this guide will help you get more time with less leave. This year, Christmas falls on a Tuesday followed by Day of Goodwill on Wednesday, 26 December. It also happens to be the school holidays, so this is a great opportunity to spend time with your family and loved-ones. Try boosting your holiday by taking leave on Monday 24 December. With that 1 day of leave you’re getting a full weekend plus 3 additional days to do what you want. One day of leave bags you 5 days off work in total - plenty of time to do all the things you want to do this Christmas. If you want to kick things up a notch, in addition to taking Monday 24 December off, take leave on Thursday 27, Friday 28 and Monday 31 December. Taking 4 days of leave in this configuration gets you a grand total of 11 days off. For the ultimate Christmas holiday leave hack, take leave from 18 to 31 December. Those 8 days of leave will get you a whopping 18 days off for your festivities and merry-making! With all the time you've just freed, you may be wondering what to do - well fret not, as we have you covered with some of the coolest things to do for your South African Christmas. While the mainstream depiction of Christmas time is snow, woolen jumpers and warm drinks - in South Africa we know that Christmas is more likely sand, bikinis and chilled cocktails. The northern Santa is overweight, wearing multiple layers of clothing and rides a sleigh pulled by reindeer, but SA Santa is toned, rocks a red and white Speedo and rides a surfboard pulled by an unified team of land and marine animals. If you're in the Eastern Cape why not check out the Wild Coast with all its neat little locations from Coffee Bay to the Hole in the Wall. The Western Cape is known to be a beach holiday paradise over the festive season with thousands of visitors, domestic and international, making their way down to Cape Town, sleepy small towns and fishing villages. If you don't mind the sheer volume of people merry-making all over, then the ocean side is a great place to be in the 'Wes Kaap' this Christmas. You can't tell South Africans to go to the ocean for a Christmas holiday cool-down and not mention KwaZulu-Natal. With the warm Indian Ocean waves lapping up against the shore in a subtropical setting, KZN is definitely hot and ready for you over the Christmas holidays. 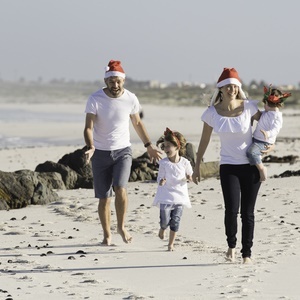 Perhaps you're averse to the salty water feel or maybe the beach just isn't for you, well South Africa has got you covered too this Christmas. Head on down to one of the many wilderness retreats that our country has to offer and chill out under spekboom or wild fig tree as you bask in the glory of South Africa's unique and diverse ecosystems. Like running the Comrades Marathon, going on a safari in the Kruger National Park is a South African rite of passage - if possible, you simply must do it once at some point in your life. Find your escape in iSimagaliso Wetland Park. Spanning 332 000 hectares, the park contains three major lake systems, eight interlinking ecosystems, 526 bird species and 25 000 year-old coastal dunes. If you're in KZN around the Christmas holidays there is no better way to escape the urban bustle than by enjoying some of the diverse experiences on offer at iSimangaliso Wetland Park. Go check out the heaviest land animals drink, play and muck about at Addo Elephant National Park. With over 600 elephants in the park, visitors can expect to be delighted by their antics. Beyond just elephants there are over 400 Cape Buffalo, lions, spotted-hyenas, warthogs and an abundance of antelope species. Make your Christmas holiday special with an experience in the wild. Share your photos and travel experiences with us at info@traveller24.com or post them on our Facebook, Twitter or Instagram accounts - you could be featured on News24.